Planned this post for Monday–but have been so overwhelmed by workmen in the house this week, it got delayed…. 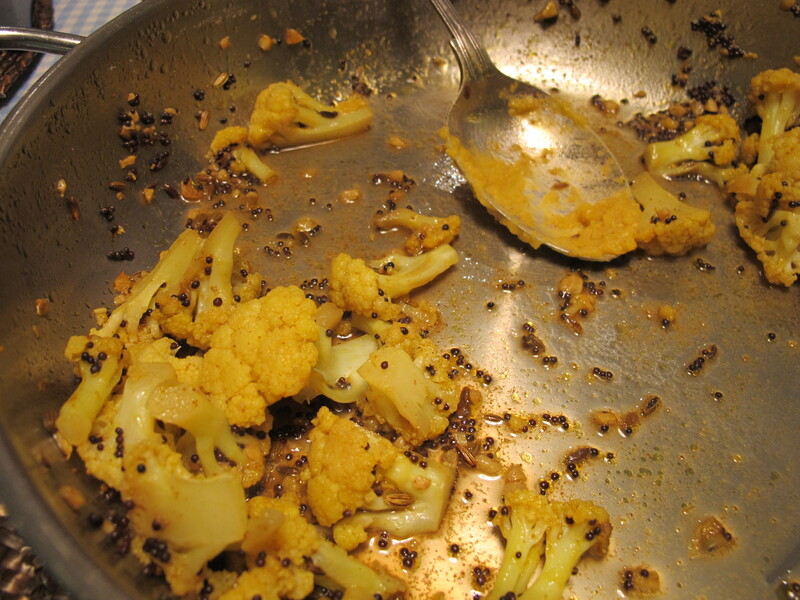 I had forgotten how delicious this spicy cauliflower dish is–and how easy to do. Perfect supper material–especially when one is feeling slightly invaded with the daily presence of decorators/painters. Didier and Jordan could not be bettered as workers and both are delightful, but there’s nowhere left to hide–they are painting all the doors and windows. That cauliflower sitting comfortably in the crisper–so unpushy these whey faced fellows–gets its chance tonight. Retrieving it from obscurity saves my bacon. Mondays can be a challenge if I forget to plan for them. There’s an option to shop of course but I like to maintain Mondays as a marketing free day–I go to four markets a week. Inspired by a recipe of Madhur Jaffrey–the cookery writer and actress. 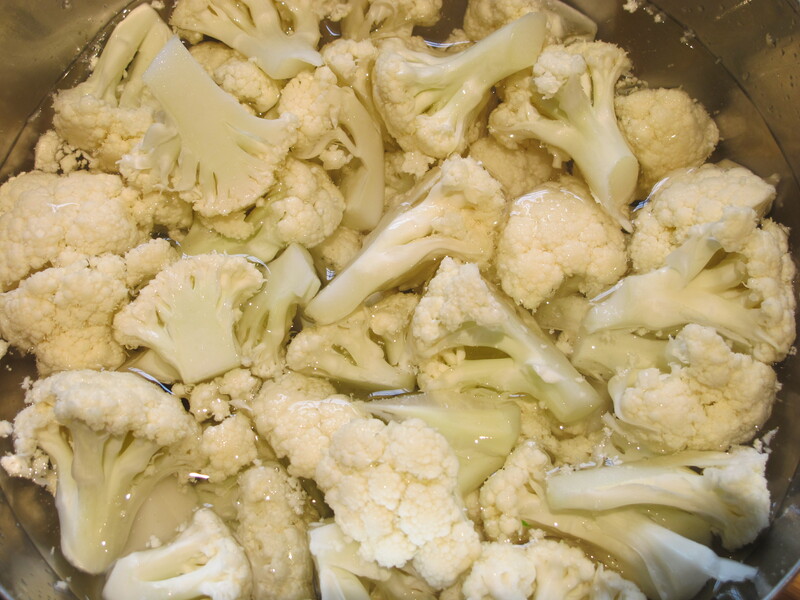 Soak the cauliflower in water for a half hour–then drain the florets. Heat the oil in a pan large enough to hold the florets in a single layer. Add the fennel and mustard seeds and sauté until they start popping. Add the turmeric and the cayenne. Add the garlic to the pan and let it colour lightly. Add the drained florets, salt and 3 tablespoons of water. Cover and cook for 10 minutes–or until the cauliflower is almost tender. Brown basmati rice, red lentil dhal and yogurt sauce accompanied it. 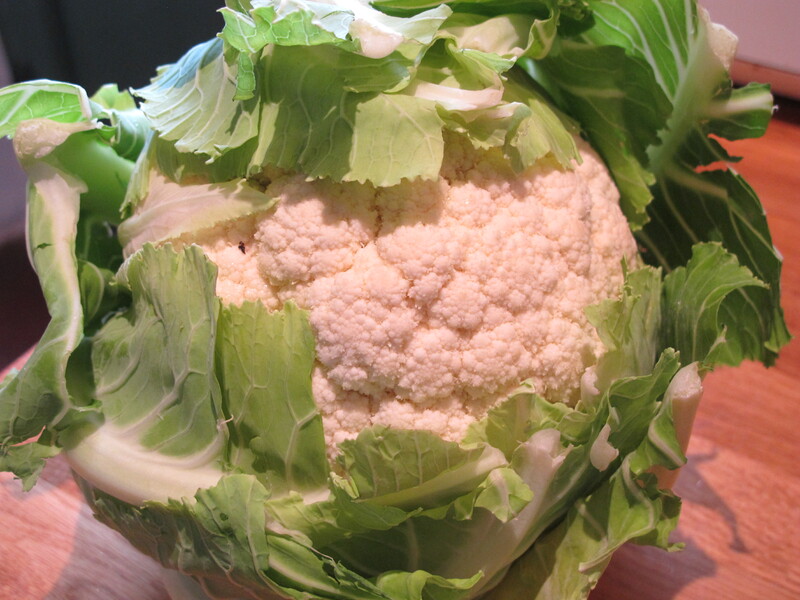 There’s a glut of cauliflowers over here in the UK at present, so will have to try this recipe. It’s right up my street, but not sure the rest of my carniverous family will appreciate it! Maybe if it was a side dish it would be OK, perhaps with some nice bacon or some chops……….. I’m not a veggie, but am beginning to veer that way again, having been brought up in a very ‘vegetable and fruit’ orientated family!! Do you remember a large shop on Tottenham Court Road in the 50s called Shearns? It sold groceries on one side and fruit & veg on the other and upstairs were three large floors of vegetarian restaurant. Mum, Grandma and I used to go there quite regularly and I remember the taste of the nut roast and gravy as if it was yesterday. We always sat at the same table and had the same waitress who I think was either Polish or Hungarian. She was a refugee from WW2 and was delightful. I can see her face now. Lovely–I don’t remember going to Shearns but I did have lunch with my father occasionally at Lyons Corner House further down TCR. I’m going to try this. Without the garlic, as I don’t like it. As I just finished reading “The making of Poldark” up pops a recipe. Dear Robin: I laughed SO hard and thus moved to suggest the following as the title of your next cookbook [or book?] So Unpushy These Whey Faced Fellows — O LOL. So amusing are you. Have you tried Broccoli-Cauliflower “bread” yet? 1 cup each riced cauli & broccoli, 2-3 eggs, 1 cup fine almond flour, herbs of choice, some sea salt, bake in a parchment lined cake pan [approx 12 x 8, 1 hour approximately at 350 F. Delicious way to get your veg and reminiscent of American “cornbread.” It’s delicious. Can also use garbanzo flour or other alternative flours [non wheat I mean] and can use as a base for pizza!!! I hope you try it, tweak it, love it. AS ALWAYS to you. Yummy!! Good morning Robin. I too have been accused of being a ” Farmers’ Market Junkie.” I can easily mainline fresh produce, and my refrigerator works overtime many days. This cauliflower rx looks tasty, I’ll make it as a side. Thank you! My wife made cauliflour soup yesterday. I bought Jaffrey’s book, An Invitation, in London back in the 70s, a sort of bible for me; then foolishly loaned it, much later. Never loan a good cookbook if you want to see it again. I posted something on The Natraj on my site yesterday. My wife has long run a small organic produce coop, in the back yard, every fortnight. It is how serious foodies here have done it, as an alternative to either grocery stores, or nonexistent local markets. Mmmm. Thank you Robbin. My husband is looking forward to this delicious Spicy Cauliflower recipe. As I am no longer able to digest potatoes (because of tummy problems which are being looked into) we are searching for potato substitutes with cauliflower the top replacer and just happens to be my better half’s favourite vegetable. You are on our top list for the best cauliflower recipes, so very well done for keeping this house happy at mealtimes, where we even raise our glass to you each meal after the first fork full of yummy Cauliflower substitute! 🙂 What would I do without you! Is the soaking of the florets for 30 minutes a way to expose any unwanted pests that might have been lurking in the curd? Or is there another reason I might have forgotten? It is–though a nice fat crunchy caterpillar could be a tasty addition to the dish. Cauliflower is really underrated – for about 85p over here you can buy a large one and make something like this or have it raw with a dip or make my all time comfort food of cauliflower cheese. Because of its texture, you don’t miss meat, it’s a gem! My late mother always soaked cauliflower in salted water to “kill the bugs.” But then she also told me if I crossed my eyes they might “stick that way.” Gotta’ love our moms and their old wives tails! I would have liked your mom! 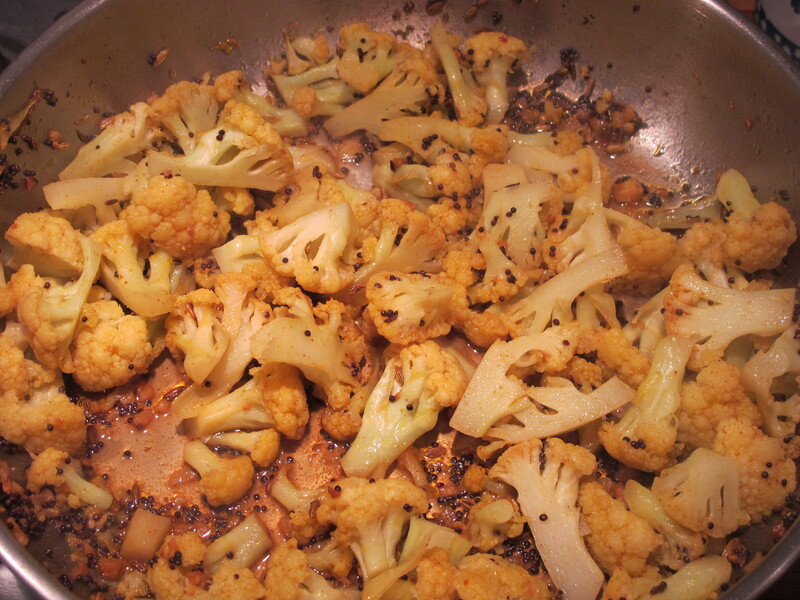 I have been making a dish that is basically Roasted Curry Cauliflower. Quite yummy. I love cauliflower but am not too fond of fennel. It tastes like licorice to me. Do the seeds also taste like licorice? Is there something else you would recommend? There’s plenty of interest there without the fennel–just leave them out. Though if you try it with you may be surprised you don’t immediately taste the fennel. I might give it a try with just a small amount. I like cauliflower enough that I can experiment with some of the other ideas here too. We eat mainly no-carbs as OH is type 2, although we might have a little brown rice with a curry – and would probably have rice with this recipe – looks delicious by the way! We usually have about 1/4 of a normal sized portion, just a token really, and then make up the bulk with another vegetable. How much rice would you have with this, if any, or would you have another veg like we do? Like you I do have a small portion of rice–basmati brown–but if there’s dal going as well I’ll favor that. With any luck they will read the comments–very thoughtful of you, thank you. Looks lovely. I usually hate Cauliflower..but will try it. You are so brilliant with vegetables! Well, if one doesn’t fancy fennel—perhaps would dill seeds be a nice substitution? I love dill–worth a try. Yes. I love dill too. Maybe even chive? I’ll have to experiment. Appreciate your cauliflower recipes as there is a glut of UK caulis at present – such a shame to think of farmers having to plough in acres of this delicious versatile veg. So the more ideas for ways of using cauli the better! LOL—thanks, and loving your accounts of the gypsy tour to the south….oh, how I would love to be there too. Keep it coming.